Tom Daniels is a school teacher in the Blue Mountains who truly believes that golf can have a positive impact on children from a young age. Tom has two children and is an avid supporter of the Junior Clinic at the Wentworth Falls Country Club (WFCC) on Sundays. Whenever he has a chance he will also take his kids out on the course for hit. According to Sports Medicine Australia, Junior Clinics, where kids as young as 5 years of age can get accustomed to the world of golf, are beneficial from both a mental and physical perspective. However, its not only a question of improving hand eye coordination and getting kids to do some exercise, there is also a social element that includes etiquette, respect and sportsmanship that is regarded as being integral with the game of golf. Furthermore, these various positive elements can be instrumental in the development and growth of young children. Lang Doolan, Club Pro at WFCC, has been holding Junior Clinics for quite some time and truly enjoys sharing his passion for golf with the young ones. Although children are ever more drawn to the digital world and love interacting with a touch screen rather than spending time outside, junior clinics are a growing trend. 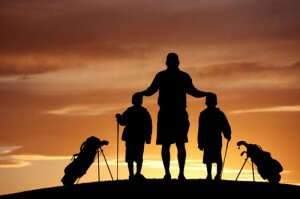 Because of its health benefits, golf is a game that many parents introduce to their children at a young age. 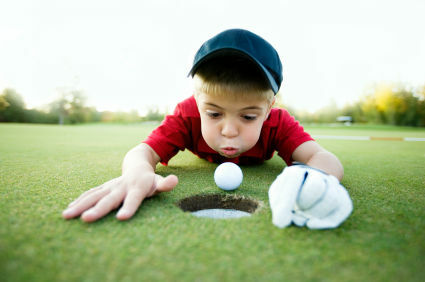 Playing golf opens up a world of activity for young ones that aids in their advancement through life. Neil Plimmer is a PGA professional in the UK that has dedicated his life to teaching young children how to play golf. In terms of physical benefits there are three areas that golf helps improve and these are stability skills, manipulative and object control skills, and awareness. Stability skills refer to agility, balance, coordination and speed. These are key skills in the game of golf as it is all about hand eye coordination and excellent balance. Manipulative and object control skills are being able to strike, catch or throw an object and in the case of golf, the dexterity golfers have with clubs comes in very handy. Lastly, awareness is of paramount importance in golf. Spatial awareness and kinesthetic awareness are sensory skills that your body uses to know where it is in space. Many structures in your body have nerve receptors that send specific information to the brain. Structures such as your inner ear tell the brain information about the head’s orientation to gravity, accelerations, decelerations, and direction of movement. You’re eyes provide depth perception, and a visual surveillance of objects around you. Your muscles have a variety of receptors that tell the brain information like; how much tension is in the muscle, how long or stretched the muscle is, how fast the muscle is moving, and most importantly what position its associated joint is in. Coupling this with other factors such as golf rules, these skills are decisive in determining whether the ball is going to end up 3 meters from the pin or in the water hazard. It is also important to remember that these skills can be applied to any sport not just golf. Whether it is rugby, football, cricket or netball, all these skills are incredibly useful throughout all the various phases of these sports. Moreover, the physical benefit of just being outside, surrounded by the gorgeous green environment is priceless. This also aids in allowing young children to breathe in good air (depending on where you live) and enjoy the outdoors. Golf is very much a mental game. It is a game where you have to stop and think, strategise and assess situations that are within the framework of very complex rules. This requires the development of mental skills such as problem solving, risk assessment and determination. Problem solving comes in very handy when you are faced with bunkers, water hazards, wind, and other obstacles and you have to reach the green. 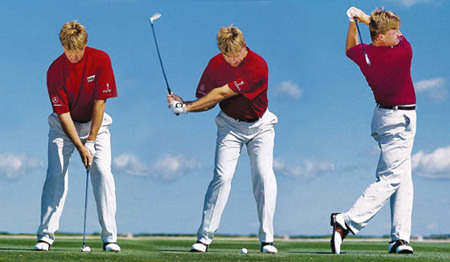 Golfers are required to think strategically to find the most efficient way of reaching the pin with the fewest strokes within the limitations at hand. Risk assessment as well is useful as it allows golfers to evaluate the cost/benefit of one type of approach as opposed to another. Should a golfer try and hit the ball over the lake and straight onto the green or allow another stroke to go around the lake? It depends on a series of factors including wind direction and speed, and a conviction in one’s own skills and abilities. Lastly, determination might seem fairly obvious in golf but it is absolutely fundamental. Being a sport where golfers solely depend on themselves, they have to be determined that they will achieve their objectives. With determination also comes perseverance and conviction. Golfers practice, practice and practice again with a clear goal in mind. All three of these skills are great to develop at a young age as they contribute to improving one’s life at every stage of its evolution. But golf isn’t only about excellent motor skills and great mental abilities. Golf is also about rules, etiquette, respect and integrity. The game of golf teaches children the principles of honesty and integrity. These are lessons that will help them deal with situations both at school and at home and interact with people in the real world. Golf is one of the few sports where one has to self impose rules and penalties. The rules and regulations of the game are varied, complex and at times dependent upon specific contexts. For a golfer to learn the rules and apply them to their game with the aim of improving and competing fairly is a true representation of honesty and integrity. Respect is also taught through learning the game of golf. Respect for others through sportsmanship but also for the environment that surrounds us. Repairing divots and raking bunkers are a way to allow for other golfer to enjoy the course as previous golfers did. Not only, but being on time and waiting for the group in front of you to progress through the course is common etiquette. This is a sign of respect and civility. In life, you treat others the same way you want to be treated in order to live in a respectful and civil society. In the same way, young children are taught not to litter on golf courses as a great deal of effort goes into the maintenance and cleaning of them. First Tee, an educational company in the US, has as their main mission to impact the lives of young people by providing educational programs that build character, instill life-enhancing values and promote healthy choices through the game of golf. They have been incredibly successful in rolling this program out across the country and have received excellent feedback from both the children who have participated and their parents. It goes without saying that these key traits of respect, honesty, integrity and working both alone and in a team are fully transferrable to the real world for both children and parents. Every Sunday, Lang Doolan, WFCC Club Pro, holds a Junior Clinic for over 20 children at the Wentworth Falls Country Club. Lang is an experienced golfing instructor and truly enjoys spending time with kids to instill in them the same passion he has for the game. Typically groups reach around 20 children from as young as 4 years of age and parents are encouraged to engage in the activities with them. Tom Daniels is one of the parents of two children that attend Lang’s clinic. Tom is a firm believer in sports as a way of educating the young ones for the present and the future. The clinics are well structured and offer children the opportunity to both learn the principles of golf but also to spend quality time with their parents. Tom mentions how involved parents are and how they truly adore spending one on one time with their kids. Both Lang and Tom believe that golf can help young ones in their development and wish to spread the concept to encourage other kids and parents to participate in the Sunday sessions. Golf is a game that is generally associated with a more senior demographic, usually ranging from the mid 40s onward. It has, however, been proven that the game can be beneficial to a younger crowd from various perspectives. These benefits are most certainly decisive in the development of children and young adults. The Wentworth Falls Country Club is an establishment that is focused on engaging the local community in order to improve their experience of living in the Blue Mountains. Matt Lark, Secretary Manager of the WFCC, has worked hard to uphold this core belief and encourages all young ones to participate in the Sunday Junior Clinics. Should you wish to learn more about the Clinics please contact the Club on 02 47571202 and ask to speak with Lang in the Pro Shop. Furthermore, we would love to hear your point of view and if you have any comments please leave them below, comment on Facebook or email us on wentworthfallscc@gmail.com. Categories: Children and Golf | Tags: children and golf, golf blue mountains, golfing children, lang doolan, tom daniels, wentworth falls, wentworth falls country club | Permalink.